When his plane touched down in Rwanda on Jan. 24, George Q. Daley became the first dean of Harvard Medical School to travel to Africa to witness the life-changing work of his colleague Paul Farmer, the Kolokotrones University Professor and chair of the Department of Global Health and Social Medicine in the Blavatnik Institute at HMS. Accompanied by a group of HMS faculty, staff, advisors, alumni and supporters, both Daley and Farmer were in Africa to celebrate the completion of the physical campus of the University of Global Health Equity (UGHE), an initiative of Partners In Health. Farmer is also co-founder and chief strategist of Partners In Health. The new home of UGHE is in Butaro, which in 2008 was one of the poorest regions in Rwanda and the last district in the east African nation without a hospital. When Butaro Hospital was completed in 2011, it was part of a seismic change in health care in the region. Both the hospital and its Cancer Center of Excellence were integrated into a health system that partnered with community health workers and village clinics from the surrounding region, helping Butaro experience the fastest decline in premature mortality ever recorded in any country, with under-five mortality dropping by 60 percent over five years. The modern medical complex now serves as a beacon, illuminating the potential of modern medicine to alleviate suffering for all people, no matter where they live. But the hospital and the clinics are not the end of the story. “Hospitals aren’t enough. Universities are the logical terminus of a shared voyage toward health and progress,” said Farmer. “Building a university is also the commencement of a new journey, a chance to elevate training and research to their rightful place in the fight against poverty and human suffering caused by disease, and the fight for human dignity,” Farmer said, speaking at the inaugural symposium of the world’s first university dedicated to global health equity, which he helped found. Through its educational efforts and under the leadership of Vice Chancellor Agnes Binagwaho, senior lecturer on global health and social medicine in the Blavatnik Institute at HMS, and Dean Abebe Bekele, UGHE aims to help fill shortages of health care providers and researchers in low-resourced settings. Such shortages are critical drivers of health inequity worldwide. The new university’s academic programs launched in 2015 with a master’s program in global health delivery (modeled on the HMS Master of Medical Sciences in Global Health Delivery program). Its students come from around the world and from diverse professional backgrounds. The first cohort of medical students is scheduled to begin classes in spring 2019 and to graduate as doctors in 2025. School leaders plan to add nursing and dental care programs soon. All of UGHE’s medical, dental and nursing students will earn joint degrees in global health delivery, toward the goal of developing a corps of clinician-researchers who can implement new programs, examine the results and use research-driven evidence to improve global health delivery, school leaders said. 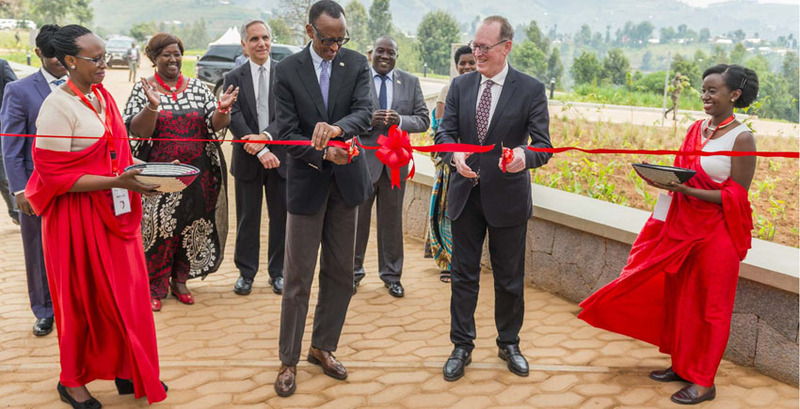 To celebrate the opening of the new campus, UGHE hosted an inaugural symposium, drawing speakers and attendees from the Government of Rwanda, Partners In Health, HMS, international academic institutions and other global health organizations. Among the speakers was HMS alumnus Philip Landrigan, a leader in environmental medicine, who highlighted the role a healthy environment plays in a healthy human population. Although UGHE is a private institution operated by PIH, it is built on a foundation of collaborations with numerous other institutions, communities and organizations, including the Government of Rwanda. The new school was built with the leadership and support of Farmer and many other HMS faculty, alumni, students and trainees from Harvard-affiliated hospitals. Daley spoke at the symposium on the role of the university in building global health equity, later participating in a panel discussion on One Health, a concept that highlights the connections between human, animal and environmental health. Daley said one of the things he appreciates most about being dean of HMS is that it allows him to be a student again. Seeing the hospital and university in Butaro, and learning more about the work of building global health equity in Rwanda, he said, gave him an unparalleled chance to learn what is being done to advance the human right to health and the role that the Harvard community is playing in that effort. “It is also giving me hope that the astonishing promise of modern medicine and biomedical science can and will reach all people,” Daley said. Daley noted that the recently updated HMS mission statement emphasizes that the School’s community is “dedicated to alleviating suffering and improving health and well-being for all,” an aspiration that HMS shares with UGHE.